I picked Patrick to give me a spin around the island—his “Red Sox” baseball cap making my choice for me. It was a delightful jaunt, offering an excellent overview of the island’s perimeter and terrain. From my open-air perch, nestled under a blanket on my lap, I soaked up the scenery and Patrick’s running commentary. 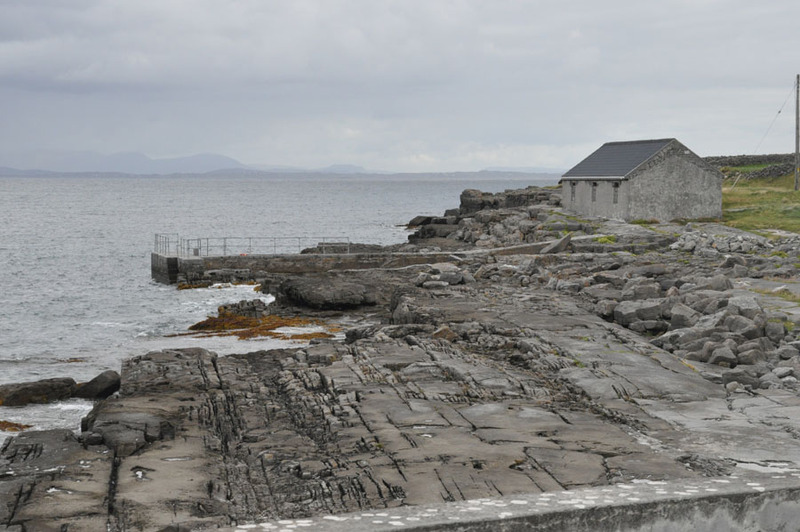 Millions of years ago, the Aran Islands were joined to the mainland and an area known as the “Burren.” Now separated by the Atlantic, they share a landscape that has no soil and is covered in limestone to such a degree it is known as “pavement.” While the rocky surface appears hard, in fact, it’s permeable and broken down by the sulfuric and nitric acid in the falling rain. There are very few trees on the island as a result of the wind and poor soil depth. Yet despite the initial impression of an inhospitable, lunar landscape, life flourishes. 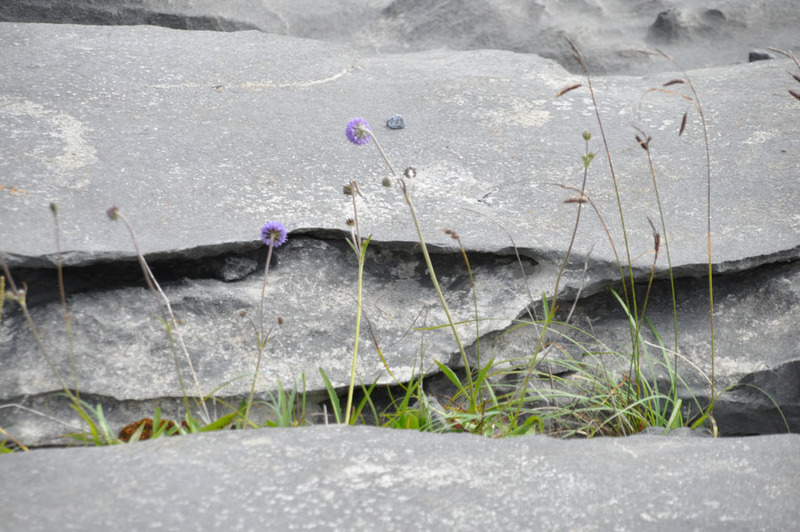 On Inis Mor, you can witness new growth taking root on barren rock. 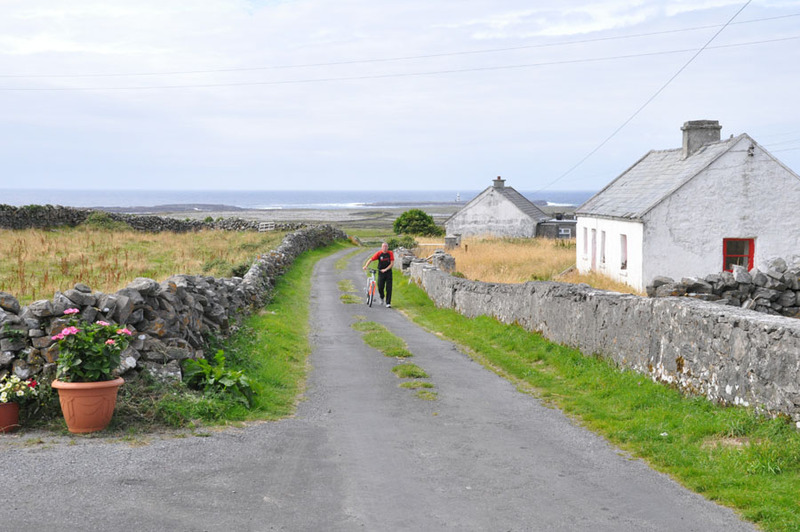 The Aran Islands, like the Burren, have an unusually temperate climate and as a result, a remarkable diversity of plant life. A wide variety of Mediterranean and alpine plants can be found side by side growing among the rocks, including orchids, gentian, and saxifragese—whose root Latin word saxifraga means literally “stone-breaker.” Blooms sprout particularly in the crevices known as “grikes,” which provide shelter for fledgling plants, and amongst rock formations known as “clints” that absorb heat when the sun is shining and release heat when temperatures go down. The contours of the land and their interaction with the elements dictate where the islands’ 14 tiny villages are located, tucked into dells and huddled against hills. There are no houses on the island’s north shore, which is exposed to the Atlantic and a ferocious wind that blows huge piles of rock up on the shore—the massive mounds are so big that visitors mistakenly often believe them to have been built intentionally as breakers. There seemed to me to be an Irish sense of irony in the wind and sea dumping even more rocks on Inis Mor. But what the Islanders have done over the centuries with all those rocks is an enduring and spectacular testimony to acceptance, ingenuity, artistry, patience and persistence. 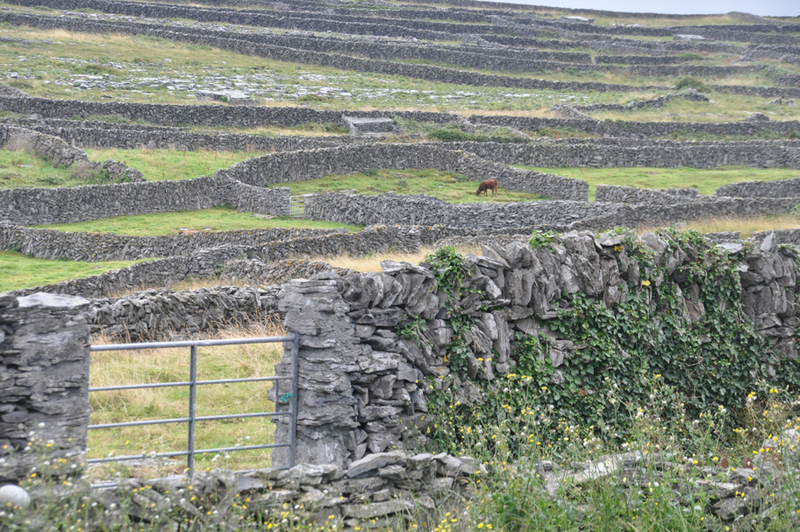 Patrick told me there are 1,000 miles of stone walls on Inis Mor. The island itself is about nine by two miles. In a system of farming known as “rundale,” land is divided into strips that go from the road to the sea. This method was a means of using the generally poor land to the best benefit of the community; it was a difficult task to divide the complex mixture of arable, rough and bog to ensure that each tenant had an equal share of good and poor land. The main “clachan” area where the small thatched cottages were concentrated was situated in a cluster on the best land–the infields–which was surrounded by mountain or grazing land of inferior quality–the outfields. The biggest single piece of property is 365 acres and was once a landlord’s home. A double wall generally signifies division of land between two farmers; a single wall is the division of fields within a farm. 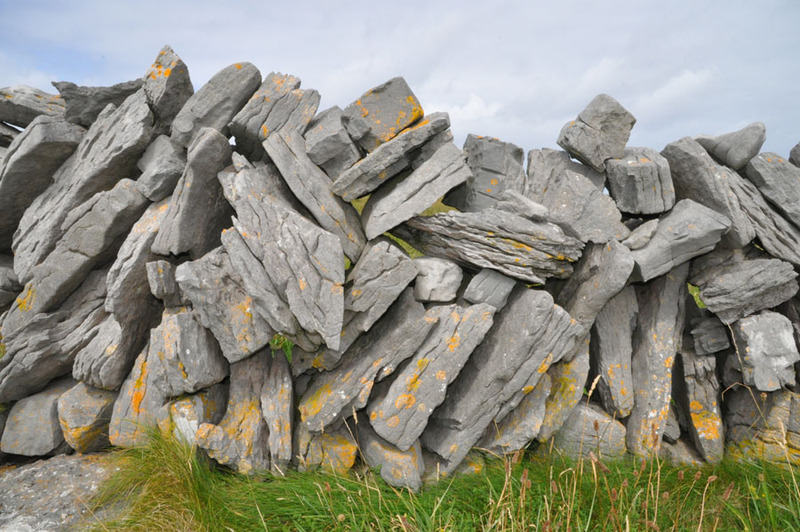 The stone fences are built with intentional gaps between the stones to allow the wind to go through them—otherwise they would be pummeled down. Others say jokingly that these gaps are “windows” that enable the cows to see how much greener the fields are in the other pastures. If your eyes are sharp and you are paying attention, you might be flummoxed to see cattle grazing in a field completely surrounded by walls, with no visible means of entry or exit. What you are in fact witnessing is a “phantom gate,” where a farmer has taken down some stones and made a gap for animals to pass and then immediately re-built the wall to keep the animals in or out. 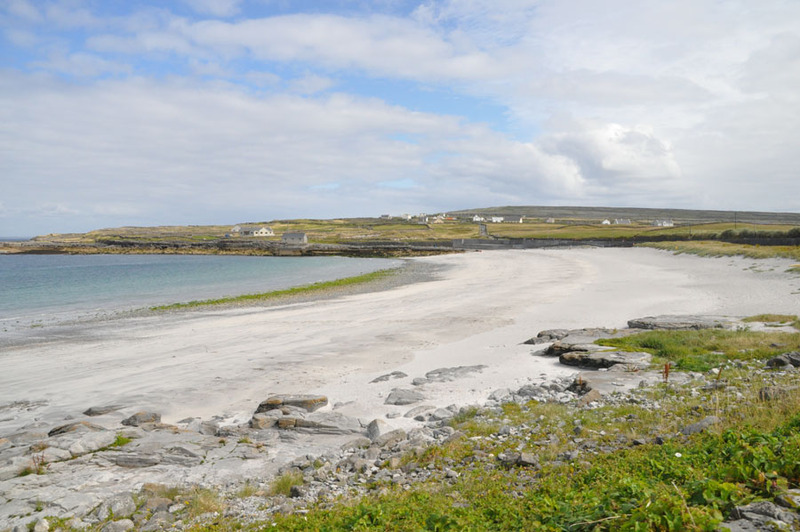 For centuries, Islanders have been creating a thin top soil by layering seaweed and sand. Other than the occasional family potato patch and garden, this man-made land can’t really support agriculture and is used primarily for grazing of cattle. 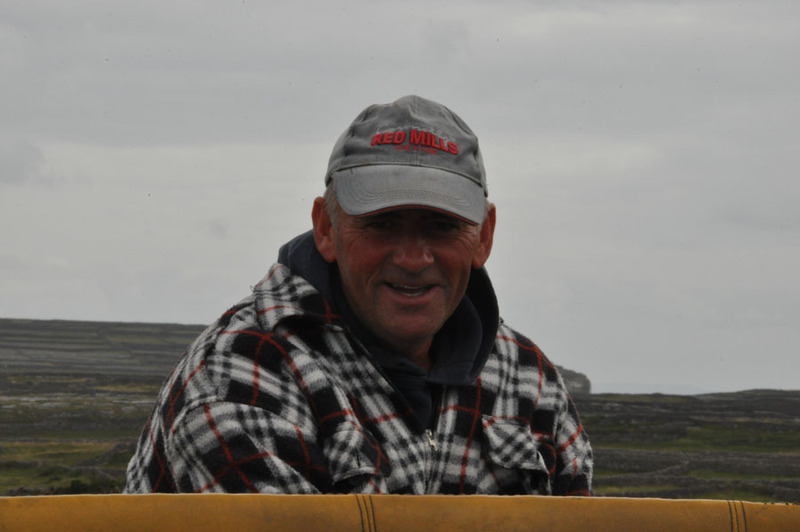 While on Inis Mor, I also met Dara Molloy, a Celtic priest, who gave me an introduction to the rich spiritual history of Inis Mor and one of its earliest leaders, Saint Enda. Enda was a prince. His father’s kingdom was Oriel on the northeast coast of Ireland. His sister Fanchea was baptized by St. Patrick and subsequently became a consecrated virgin. Enda helped her build her monastery in a place now called Killanny in Monghan. 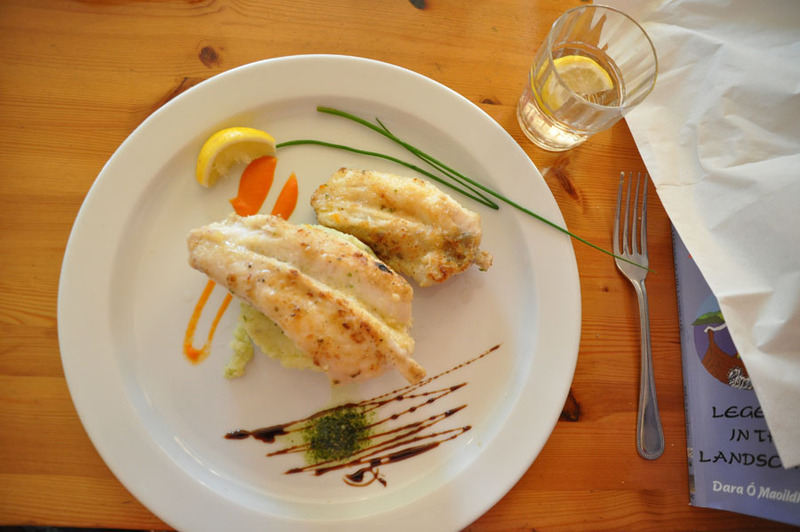 Enda travelled Europe as a young monk seeking his “place of resurrection.” On his travels he was influenced by St. Martin of Tours, St. Honoratus on the Isle of Lerins, St. David in Wales, and St. Ninian in Whithorn, Scotland. However, eventually, he returned to Ireland and set upmonasteries on the River Boyne near his home. Enda’s other sister Darina married the King of Cashel, Aonghus. They lived in a castle on the Rock of Cashel in Tipperary. Through the influence of his sister, Enda had an opportunity to build monasteries in the southern kingdom, which included Aran. Enda, to the king’s surprise, requested Aran, and he was granted it. 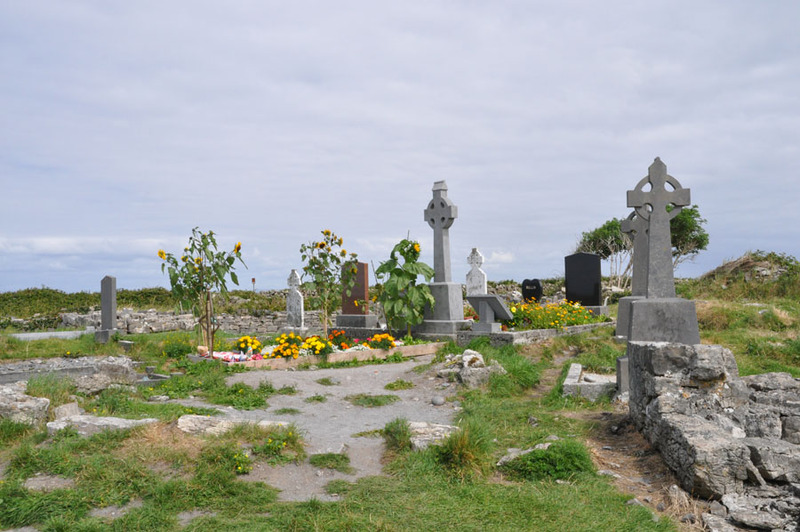 Enda came to Aran around 485 A.D. with 150 monks and set up ten monasteries across the island. Dara told me Teaghlach Einne is the place of resurrection of Enda of Aran. His body faces east to greet the rising Easter sun. “When you find your place of resurrection on this earth, and move to live there, your life takes on a fullness and a fruitfulness that would not have been possible otherwise,” Dara said. I myself am still on the move, searching for my own personal place of resurrection. But I can see why Dara has found his in Inis Mor, and why others like Patrick, Padrais, Maura and Ronan have remained rooted on this windy, rocky isle.